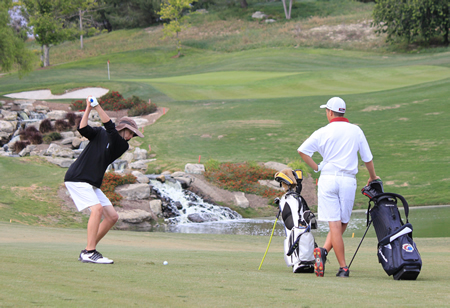 Senior John Grayden watches as freshman Drake Dvorak hit his approach shot on #17 during Laguna’s league title clinching victory over Estancia at Aliso Viejo Country Club. 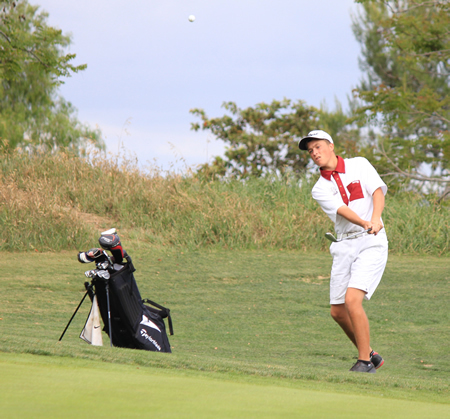 The Laguna Beach High School boys’ golf team ended a four-year title drought by beating Estancia 212 – 215 on Thursday, April 22, at Aliso Viejo Country Club. It was the fourth Orange Coast League title overall for 12-year head coach Scott Finn. The Breakers followed that win with regular-season victory over the Costa Mesa Mustangs on Tuesday, April 28, at Ben Browns, capping a perfect 9-0 league record. John Grayden chips onto the green during Laguna’s league title clinching victory over Estancia at Aliso Viejo Country Club. Dvorak, who started playing Junior World tournaments at 12 and once shot a 64 as a middle-schooler, credits Grayden with lifting his spirits as he tried to find his swing during a season-long slump. “When you’re like kind of down or not playing well, he has good words for you,” said Dvorak. Grayden didn’t take up the game until seventh grade. But that didn’t stop him from going out for varsity his freshman year. At first, Finn had his doubts about the newcomer. “It’s a tough game,” said Finn, who didn’t start playing until he was 21 as a sideline to his pursuit of a surfing career. Finn saw leadership qualities in Grayden early on and made him captain during his junior season. “He puts others before himself and he works hard. He’s humble. Those are just good qualities for anybody to be around,” said Finn. Giving back comes natural to Grayden. He spent the last two summers working with disabled youth at Special Camp for Special Kids in San Juan Capistrano, an experience that “definitely put things into perspective” for him, when he realized how much a few hours of his time meant to those kids. “They had the time of their lives,” he said. Beneath a calm, easy going exterior, Grayden said he sometimes gets a little tense on the course. That’s when Finn steps in. “He kind of guides me and makes sure I stay mentally focused,” said Grayden. Although young, the Breakers are deep. Grayden, Dvorak and junior Max Brown form the team’s nucleus, while junior Ryan Gee, who is also competing as half of Laguna’s top doubles team in tennis, has made some key contributions. Intra-squad competition has not only brought out their best, it also has brought them closer. They regularly go out to dinner after matches, and they hang out together both on and off campus. “It’s tough with a big age gap, but our team chemistry is pretty good,” said Grayden. It’ll take more than good chemistry to get past the first round of CIF, though. However his final high school season ends up, Grayden will study mechanical engineering next year at Purdue University in Indiana, where he hopes to make it as a walk on. “I just have to keep improving to be able to do that,” he said.